A voter exercises his constitutional right (file photo). Excitement is high in the Rwandan community abroad as members cast their votes today, a day before citizens in the country also make their choice on who should lead the country for the next seven years. 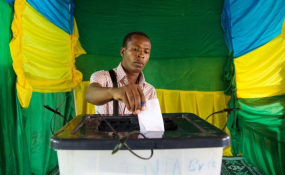 The contest is between incumbent President Paul Kagame (RPF-Inkotanyi), Frank Habineza (Democratic Green Party of Rwanda), and Philippe Mpayimana, an independent. Officials at the National Electoral Commission (NEC) say polling kits have already arrived at all polling stations abroad to ensure the poll runs smoothly. More than 44,000 registered Diaspora voters from the different countries across the world are set to cast their vote. Amb. Olivier Nduhungirehe, Rwanda's envoy to Belgium and Luxembourg, said the embassy as well as the Rwandan community living in those two countries were ready for the presidential election. "We have around 4,500 Rwandans registered on the voters list, the biggest number in the northern hemisphere, and many of them are following the campaign on a daily basis, through YouTube, livestreaming of campaigns and social media," Amb. Nduhungirehe said. "Rwandans here are excited to cast their vote and choose their President. We have three polling stations; at the Embassy of Rwanda in Brussels, in the Belgian city of Liège, and at the Rwandan Consulate in Luxembourg. The vote will start at 7am and end at 9pm, to allow Rwandans to organise themselves on this working day." The thrill is also being felt in neighbouring Uganda where a large Rwandan population resides. According to the High Commission in Uganda, over 7,000 people are expected to cast their ballot from the embassy. Christine Mbabazi Rwanziza, a fresh graduate living and working in Kampala, Uganda, is excited, especially as this will be the first time she votes. "I will head to the Rwanda High Commission to vote tomorrow. It's a chance for me to exercise my right as a Rwandan. I can't wait to vote for the most rightful person who is going to take my motherland to another level," Mbabazi said. Meanwhile, in South Africa, Dr Michael Mugaba, a gynaecologist who is currently in Johannesburg, is excited as well. "I am excited. Tomorrow it's going down at the (Rwandan) high commission in Pretoria. We just want to make our vote count. I am about 45 minutes from the High Commission, I will be driving there," he said. Mugabe said that a social media platform had already been created by Rwandans living in the Diaspora and it is dubbed "people can't wait to cast their vote," to encourage those living abroad to turn up for elections. Elsewhere, Rwanda's High Commissioner to Nigeria, Stanislas Kamanzi, who is also in charge of three other West African countries - Guinea-Conakry, Ghana, Ivory Coast, and Benin, said voters in these countries are all set. The envoy said there are between 150 and 200 voters for the four polling stations. Kamanzi said: "We are all set. We will have four polling stations; Abuja, Abidjan, Accra and Cotonou. Polling stations were established based on the minimum number of voters in the same locality as set by the National Electoral Commission. "Everyone is mobilised and coordination arrangements are in place. All we miss is the cheerful and inspiring campaign atmosphere that are in Rwanda. We just made do with TV and social media." There are 98 polling stations abroad in all countries where the country has diplomatic missions, save for Burundi and the DR Congo.